With the right containers, you can cook a huge meal in one day and make the food last for several days. Meal prep containers are also great for controlling portion sizes, which is very useful for fitness and training. Containers can be great for setting up dinner, lunch and breakfast meals for an entire week, and they’re very important products for women who’re trying to build lean muscle mass and look their best. What Are Glass Meal Prep Containers? Meal prep is very important for losing or gaining weight because it gives you total control over the number of calories you’re consuming every day. Since a set of containers can be measured easily, you’ll know exactly how many calories you’re getting from each prepared meal. When shopping for these products, you’ll find a vast selection to choose from, and depending on your needs, some products are better than others. Many fitness enthusiasts prefer containers made from glass because they don’t contain harmful BPAs, and they’re also resistant to smells and stains. However, glass also comes with several disadvantages, which should be considered before you make a purchase. Meal prep containers made from glass are healthier than plastic, but they’re also much easier to break, and they’re nowhere near as portable as plastic. Most people who engage in meal prepping will have to decide between glass and plastic products, and although plastic is much more popular than glass, the healthiest option will always be glass. With the right containers, you can prepare every meal several days in advance and enjoy the benefits of not having to prepare a meal every day. Containers make it easy to bulk prepare your food, which is especially important for women who’re into fitness. You’ve probably watched someone heat up leftovers in a plastic container, and there is a good chance that you’ve even done this yourself. The problem is that most people don’t consider what the plastic is made out of, and they just assume that it’s safe to use. When you heat up food inside of many plastic meal prep containers, you end up mixing many harmful chemicals into the food. The dangerous compounds leaking out of the plastic will quickly ruin that beautiful meal you’ve just made. The major culprits are BPS and BPA, which are known carcinogens. Some plastic containers are safe to use, but in most cases, it makes more sense to purchase glass containers. One of the major benefits of using glass containers is a solid seal, which will prolong the life of every meal. It’s much easier to get a solid seal with glass, and when sealed properly, your meals will stay air tight for about two weeks. Glass containers are also preferred because they repel bacteria, odor and stains. Unlike many types of plastic, glass is also easier to wash, and you can quickly clean it with a dishwasher. When it comes to safety, you don’t want to end up with the wrong products, so it’s a good idea to purchase meal prep containers made from glass. When searching for meal prep containers to buy, you should know what to look for because you don’t want to waste your time with shady products. Since these products are made from glass, durability is very important, and it’s best to consider buying thicker products. The benefit of thicker glass is that it won’t break as easily. You should also look for products that don’t leak because you want to make sure your meals are protected by a tight seal. You don’t want the contents of the containers leaking all over your refrigerator and creating an unnecessary mess. For maximum convenience, you should consider products that are microwave safe because most people don’t have time to transfer and cook prepared meals on the stove. Before making a purchase, consider if the glass containers are freezer friendly and check to see if they have containers. Most fitness enthusiasts prefer glass because it lasts longer than plastic, and it doesn’t absorb odors from food. It also won’t fade over time and can be a great option for the oven. You’ll find that most glass meal containers also offer a better seal than plastic, which prolongs the lifespan of every meal. It’s very common for glass containers to come with plastic lids because the idea of glass lids doesn’t make much sense. Before deciding on a specific product, you should make sure it doesn’t contain BPA, and you should also check to make sure it’s FDA approved. Once a product has been cleared by the FDA, you can trust the safety of the product. It’s very important to avoid purchasing products that are made with harmful chemicals because you don’t want petroleum carcinogens mixing in with your food. For convenience, you should avoid buying products that can’t be washed in a dishwasher. Since meal prep is supposed to save time, you don’t want to spend an entire day manually scrubbing 20 glass containers. It’s important to purchase the right size because you don’t want to waste time with containers that can’t hold enough food. On the flipside, you don’t want containers that hold too much food, and the size of the containers should be perfect for your nutrition goals. 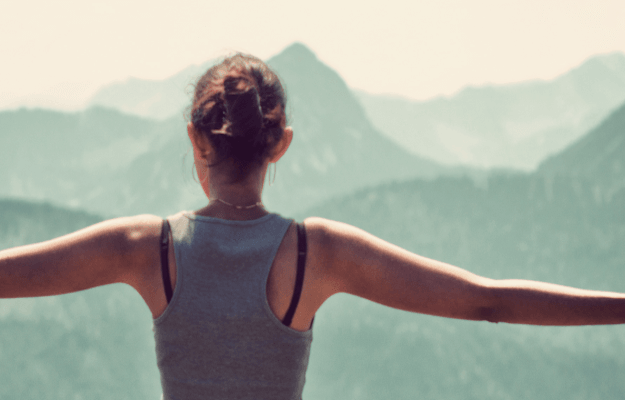 You don’t want to make the mistake of skipping over the product dimensions and purchasing containers that aren’t the best size for your goals. Glass containers can be extremely helpful when you’re trying to prepare meals and manage your weight, but they can also harbor dangerous bacteria. When trying to maintain these products, the biggest enemy that you’ll face is bacteria, and if it’s not killed, it will quickly multiply and get out of control. Fortunately, glass containers don’t need to be cleaned nearly as much as plastic, but you’ll still need to wash them when you’re finished consuming your meal. The good news is that most products can be washed in the dishwasher, which allows you to skip the manual labor. To protect your investment, make sure to store glass containers in a location where they’re unlikely to fall and break. Since glass is very fragile, one of the greatest threats faced by your new containers is a long fall. An accidental drop from a cupboard can have you sweeping up the pieces and tossing them into the trash. These are five of the best one’s I’ve come across and used to prep meals over the years. The Kinetic Go Green Glass Works containers are designed for meal prepping, and they’re available in three different sizes. Each container is FDA approved and BPA free, and the size of the containers is great for a variety of different meals. These products come with a ventilated lid, which makes them perfect for microwaving prepared meals. The patented lid features four locking mechanisms, and it’s very good at providing a solid seal. The silicone seal helps your meal stay fresher for up to three times longer than inferior products. When used without the lid, these glass containers can be heated in the oven, and they’re safe in heat up to 450 degrees Fahrenheit. These meal prep containers are safe for the freezer, refrigerator and dishwasher, and for easy cleaning, the silicone seal can be removed. Kinetic is a well-known brand for food storage, and these high-quality storage containers make meal prepping easy and convenient. Since each set comes with six pieces, you get three containers and lids. The seal provided by the silicone is air and watertight, and when compared with several other products, these containers offer better performance. 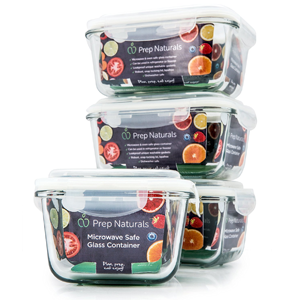 Here we have some popular products from Prep Naturals, and since they’re stackable containers, they’re convenient options for most meal preppers. 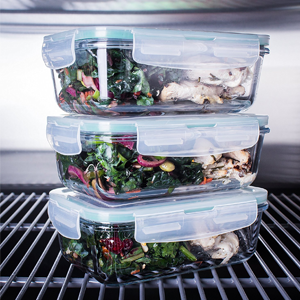 These glass containers come with smart locking lids, which keep food sealed and eliminate the risk of spilling. If you’re looking for reliable portion control and need a long-term storage solution, these containers are worth considering. They’ll help you save time by allowing you to freeze and cook your meals, and the glass can be washed in a dishwasher. However, you should know that the lids are not dishwasher safe, so you’ll need to wash them manually. 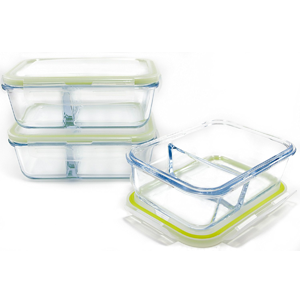 These containers can help you save money on dishes and keep hygiene standards high. 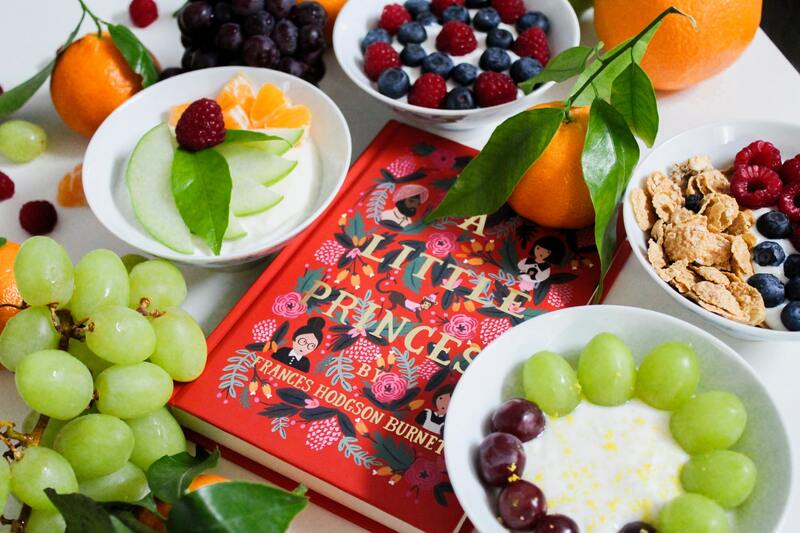 The materials used to make the products are LFGB and FDA approved, and they’re guaranteed to be BPA free. For use in the microwave, freezer or oven, each container comes with a robust lockbox, and you don’t have to worry about unwanted material warping. If you’d like to prep meals at home and take them with you, these glass containers from Prep Naturals might be able to help. These are some popular meal prep containers from IdealPrep, and unlike many alternative products, they’re made with dividers. For many years, containers have lacked separate compartments, and these products are designed to fill this gap. With separate compartments, it’s easier to store different types of good in a single container. A major problem for many meal preppers is food mixing, and although some foods can be mixed together, there are certain types that you wouldn’t want to mix. The IdealPrep glass containers are made without BPA, and they allow you to heat your food without mixing harmful chemicals into your food. The main problem with most plastic containers is that they tend to melt in the microwave, and they’re also made with unwanted chemicals. Since these products are made from glass, they don’t suffer from the same pitfalls as plastic, and they make portion control much easier. For maximum durability, each container is made from borosilicate glass, which offers greater durability than several competing products. 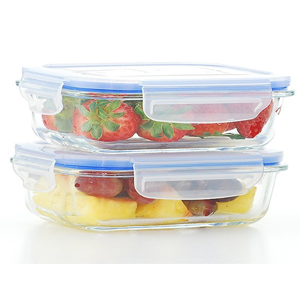 These containers come with leak-proof lids, and the silicone seal allows the lids to snap into place. Here we have some more great products from MealPrep, and each container features a non-toxic, durable and eco-friendly design. These products offer superior safety, convenience and sturdiness, and the plastic lids aren’t made with BPA. For a tighter seal, the plastic lids snap into place, and the silicone gasket helps to keep foods fresh. The MealPrep food storage containers are great for portability and portion control, and they’re very easy to travel with. Each container can be used in the dishwasher, oven, microwave or freezer, and it can withstand temperatures up to 450 degrees Fahrenheit. If you’re looking for an easy way to prep meals and control your portions, these products should be considered. The high-quality glass doesn’t get stained, and it won’t absorb odors. 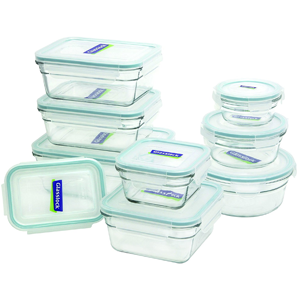 The Glasslock containers are great for meal prepping, and the set comes with a total of 18 pieces. Since these products are safe for the microwave and oven, they make it easy to heat up leftover food. Each container is made with an airtight design, and the lids are made to eliminate unwanted leaking. The materials used to make these containers are recyclable and BPA free, and the set comes with a variety of different sizes. With a total of 18 pieces, the set comes with nine containers and lids. Glasslock products offer the flexibility of portable containers, and since they’re made from glass, you don’t have to worry about odors and stains. All Glasslock products are created from soda ash, limestone and silica, and they should be viewed as eco-friendly products. With the right meal prep containers, you can save time and invest in your health. Meal prepping serves as a great way to save money because you’re less likely to waste food. Another benefit of preparing meals ahead of time is reduced stress. Life is notorious for unexpected problems, and if you’ve already prepared meals for the entire week, you’re much more likely to end up in a stressful situation because you have no time to prepare a meal.